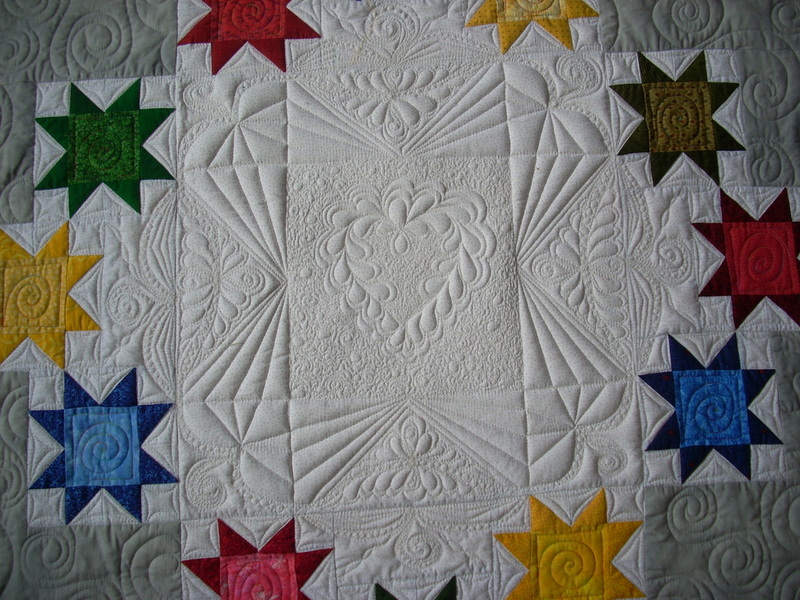 Using machine quilting, a professional longarm quilter provides your choice of serveral types of batting, uses your backing and quilts the quilt top with a beautiful pattern. You can select from our Pantographs or we can custom create a design for you. The quilt itself will dictate the free-motion design that will be used. We will discuss your wishes and desires for the quilt, what it will be used for, who will get it, what message you are conveying in the quilt, and go from there. There is more versatility and detail with free motion quilting, which gives the opportunity to be more expressive. 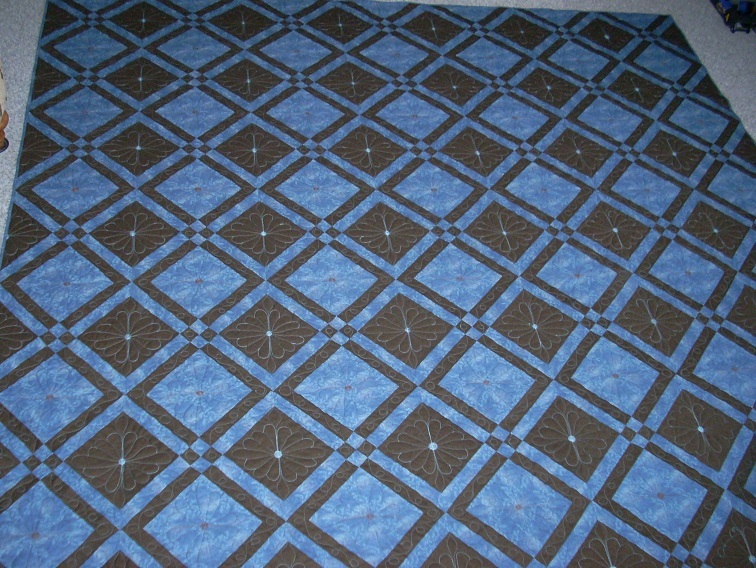 Consequently, free motion quilting takes longer and costs more, but the end results are usually much more spectacular. There will be elements available for you to choose from in planning the free motion designs for your quilt. 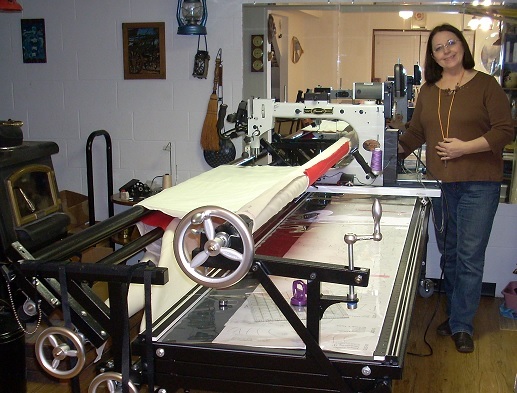 Jackie longarm quilts on a brand new Gammill Plus Vision 22″ Stitch Regulated Longarm Quilting System. You may mail/ship your project to me for professional services. Follow the instructions given here to safely send your quilt top to me. Customers pay all shipping charges. I will return with insurance of $500 – no appraisal. In February 2012 I gave a talk to a group of women. In December my husband and I decided to go out to eat and sat down and this gal came and sat down by me. She said her name was Michelle, she said to me, “You are Jackie Lehto aren’t you?” She continued to say she had heard me speak last February. Then she proceeded to say her mom had a couple of quilts and wondered if I might be able to longarm quilt them for Christmas. I said, “Of course.” Well, her mom called me the next Monday and come to find out she lives in Texas. So, she mailed the quilts to me and this is one of them. She did an amazing job of piecing and the quilt with the custom job on it was quite stunning. Quilt Story: I have a couple of favorite charities that I donate quilts or quilting to each year. This particular quilt was pieced by Joan Spears and quilted by Jackie for the Florence, WI Historical Society's annual Strawberry Festival and Quilt Raffle in 2016. 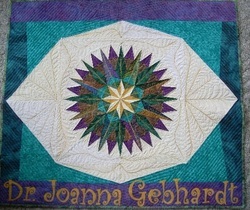 The beautiful design in the center was designed by Jackie and then quilted. It definitely took this quilt from everyday ordinary to dressed up to the extraordinary. 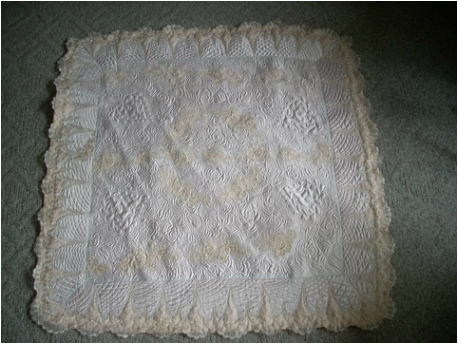 A lot of people have used wedding gowns for baptismal gowns - how about a baby quilt - OR - a wall hanging for your own home. A beautiful way to save your precious memory. As a wall hanging, you could enjoy your dress all the time. I made this baby quilt for a grandmother out of her wedding dress for her first grand daughter coming soon. Wonderful idea, fabulous quilt. Probably the most beautiful quilt I have ever made!